The 133-meter, 44-level La Trobe Tower apartment building has used an innovative new prefabricated construction method in order to become Australia’s tallest prefabricated building. Delivered 30 percent faster (eight months earlier) than if a conventional approach were used, the project is one of the first of its kind in the world and has proven to be a safer, less disruptive and more sustainable way to build. The construction method used prefabricated building elements, including modular bathroom pods, precast concrete slabs and pre-attached windows. The basic structural architecture was designed to be scalable with occupancies that can span across multiple modules to generate generous floor spaces, and has the flexibility to provide limitless spatial layouts and capability to build to any height. 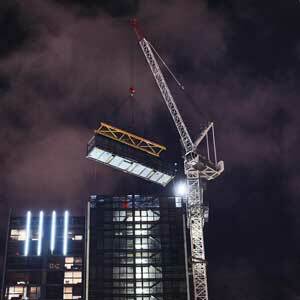 In another first for Australian construction, the oversized prefabricated components were lifted into place at night to avoid disrupting tram and vehicle traffic on La Trobe Street. A quiet electric crane and strict noise control measures were put in place and monitored throughout the eight-month night work period to ensure neighboring residents were not disturbed by the activity.